If you use Shopify, you can follow the instructions below to access your Shopify customer data within Zendesk Chat and add the Chat widget to your Shopify storefront. Note: Zendesk Chat for Shopify is only available for Chat accounts that are integrated with Zendesk Support. See Setting up Zendesk Chat in Zendesk Support. Navigate to the Zendesk Chat app page in the Zendesk Apps Marketplace (see Zendesk Chat). You will be redirected to an Authorization page, click Install app. Enter your Zendesk subdomain, then check the I agree to the Shopify Agreement box. Click Allow to permit Shopify to access your Zendesk account. 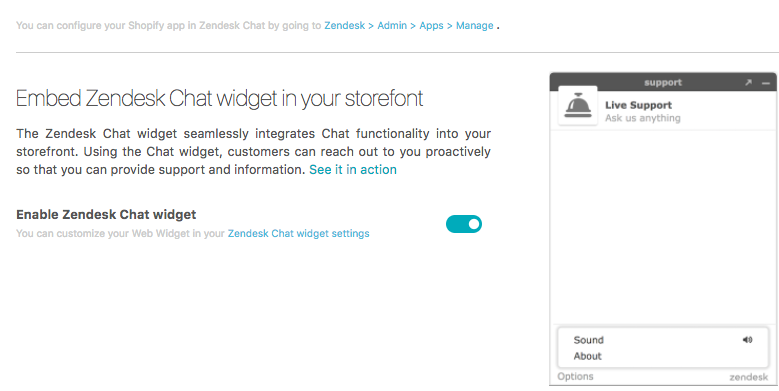 Ensure the Enable Zendesk Chat widget is toggled to embed Zendesk Chat in your Shopify storefront. 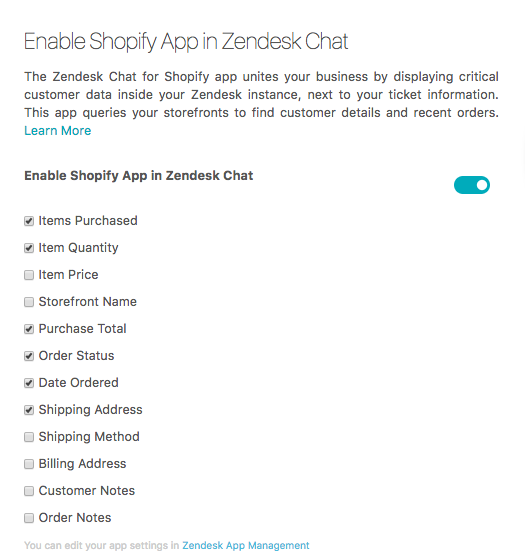 Ensure the Enable Shopify App in Zendesk Chat is toggled to add your Shopify customer data to Zendesk Chat. Under Enable Shopify App in Zendesk Chat, select the information you would like to integrate in your Zendesk Chat. Click Save at the bottom of the page to update any changes to the information. Click Save at the top of the page when you are finished. Is this process absolutely required? I did not do it. I just installed the app in shopify and gave it the credentials and it is working fine. Adding the Shopify app automates the process of embedding the widget. Some customers want more flexibility on where the widget appears and in those cases they would need to paste the widget embed snippet on specific pages in their Shopify store.